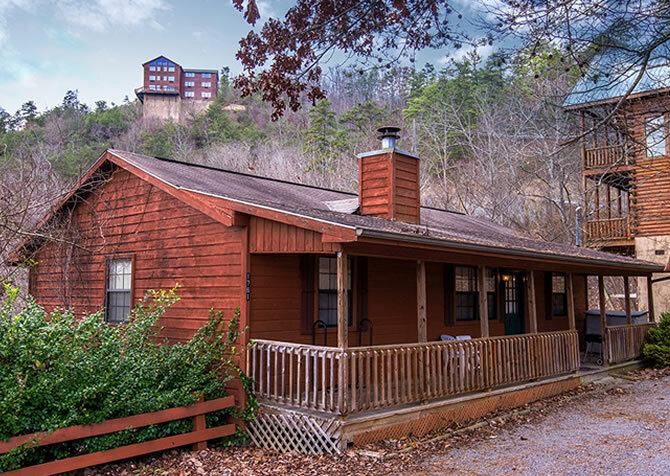 A great mix of Smoky Mountain serenity and the excitement of downtown Pigeon Forge, Come Back Inn is near the Parkway while still offering peaceful wooded views. 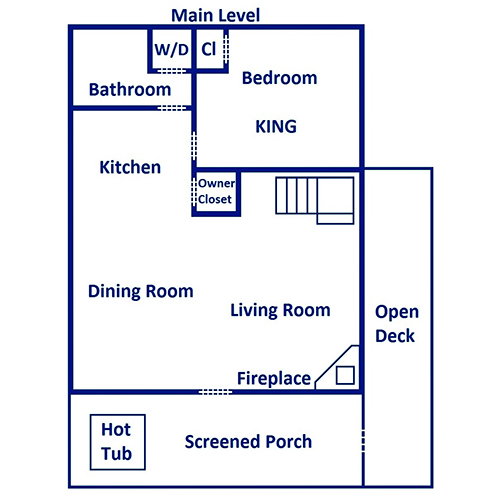 You can spend days relaxing on the screened-in deck, or you can take the short drive to downtown to shop, eat, and explore the area. Pigeon Forge is jam-packed with things to do: rides at Dollywood, water features at Splash Country, brand-name stores at the Tanger Outlets, celebrities at the Hollywood Wax Museum, rich history at the Titanic Museum Attraction, go kart tracks, laser tag, arcades, distilleries, and so much more. 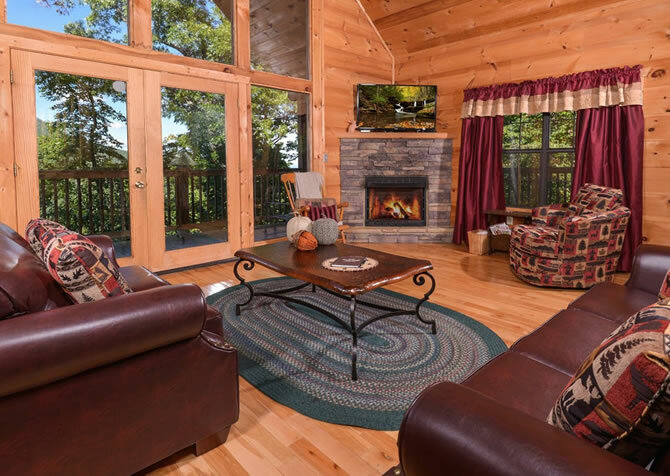 At Come Back Inn, you’ll find a comfortable, beautiful place to call home when you’re in the Smokies. The cozy living room is great for relaxing with family and friends, and the bedrooms boast king-size beds and their own TVs. In the fully equipped kitchen, make meals to enjoy in the cabin. In the rec room, play pool, flip on the TV, or bring board games to play at the table. You’ll even have a private place to enjoy the serene mountain surroundings on the screened-in deck. 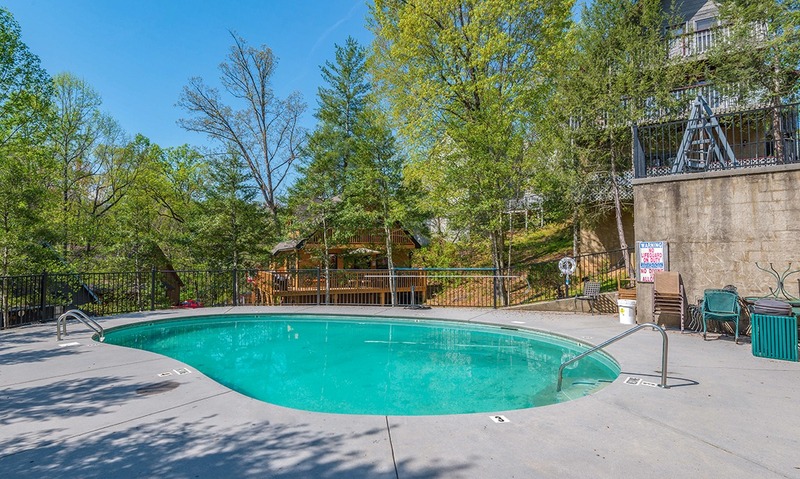 You can climb into the hot tub, read a book in the rocking chair, or sit down with a drink in the deck chairs while you get some fresh air and watch the trees blow in the breeze. Come Back Inn also gives you those conveniences you appreciate at home, making your stays easier and more comfortable. A paved driveway is a nice touch, and Wi-Fi lets you keep in touch while you’re away or see what’s happening via our blog. You can pack light and take advantage of the washer/dryer, sleep in a bit for TV in bed, or bring movies to watch on the DVD player. All throughout the cabin, you’ll find homey touches that make Come Back Inn a place you really want to come back to. Vacation is all about spending time with friends and family, and the living room of Come Back Inn is the perfect place to do that. A cozy couch and loveseat flank the fireplace, perfect for gathering to chat, unwind, or play games. The big screen TV is mounted on the fireplace, and the coffee table gives you a place to have drinks and snacks at your fingertip. On cool mountain nights, gather here in front of the fireplace. The living room also offers an open floorplan, making it easy for guests in the living room to still visit with others grabbing a snack or a drink in the kitchen. If you’re having movie night, move the coffee table to the side and let the kids set out blankets and pillows for a pallet. It’ll be easy to pop some popcorn or grab a drink while you relax and unwind here. Whether you’re wanting to save some money by cooking your own meals or just want a place to keep leftovers after going out to eat, the full kitchen in Come Back Inn will be a convenience. There is plenty of counter space to prep for meals or set out some snacks, and you’ll have countertop essentials like a coffeemaker, toaster, and knife set. Full-size appliances include a refrigerator, stove/oven, built-in microwave, and dishwasher, and the kitchen is equipped with enough dishes, glassware, and utensils for meals at the cabin. Just off the kitchen in Come Back Inn is the dining area, great for big mountain breakfasts, easy lunches, and intimate family dinners. The high-top table seats 6 beneath a rustic antler chandelier. The breakfast bar in the kitchen – next to the table – has 3 bar stools if you’ll have a full cabin. Stop by the Gatlinburg Farmers Market for fresh fruits or jams, or head over to The Old Mill or The Apple Barn for pancake and biscuit mixes for breakfast at the cabin. 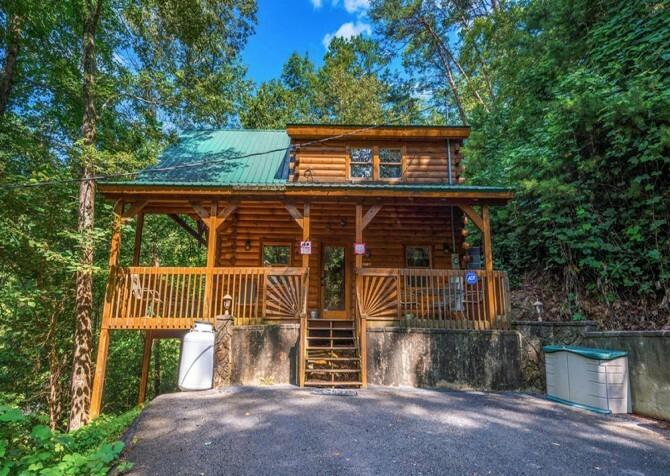 While Pigeon Forge, just a short drive away, has plenty of fun things to do, you don’t have to leave the cabin when you want to have some fun. 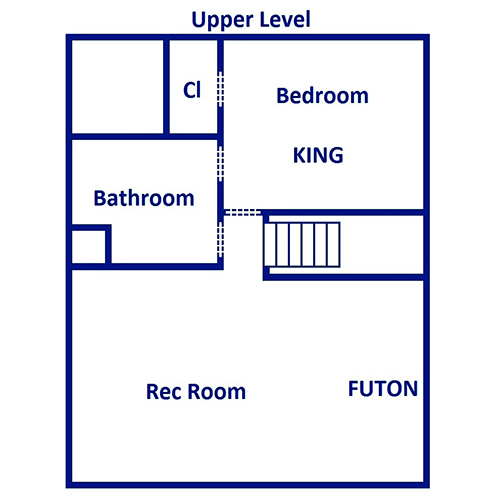 Head upstairs to your game loft, where you can play pool, bring cards and board games to play at the table, or relax on the futon and watch some TV. Rainy day or lazy day, the game room is a great place to play. The 2 bedrooms in Come Back Inn are peaceful retreats in the mountains. After days shopping at the outlets, riding roller coasters at Dollywood, or checking out the attractions along the Parkway, they’ll be much-appreciated spaces. Each has a king-size log bed, along with nightstands and bedside lamps that match the mountain motif. You’ll have full-length mirrors on the closet doors, along with dressers and flatscreen TVs. Besides the 2 king-size beds, Come Back Inn offers extra sleeping space with 1 sleeper sofa and 1 futon. Come Back Inn offers lots of cozy spaces inside, and the outside is equally inviting. A screened-in porch lets you enjoy the great outdoors any time of year – and even when it’s raining. Start your morning with a cup of coffee in the rocking chair or spend a quiet afternoon reading a book in the chairs here. At night, climb into the hot tub to soothe tired muscles after a long drive or a day of hiking in the Great Smoky Mountains National Park. On the screened-in deck, breathe in the fresh air and enjoy the serenity of the surrounding trees. It’s the perfect place to slow down and let your worries blow away with the breeze. Or you can step out onto the open deck and fire up the gas grill for a cookout at the cabin. In summer, grab your swimsuits and take advantage of the community pool! *Parking and driving in the neighborhood is a bit tight, so be prepared. Come Back Inn is all about comfort and convenience, so you’ll have the perks of a vacation rental with the comforts you enjoy at home. 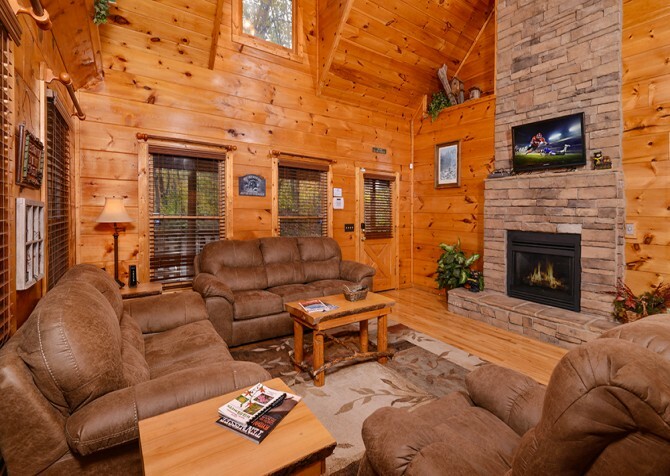 Stay connected with Wi-Fi in the cabin, pack light and do laundry with the washer/dryer, and bring the kids’ favorite movies to play on the DVD player. Play the day away with roller coasters, delicious desserts, Southern-style restaurants, carnival games and prizes, kids’ rides, live shows, and more! Walk the Grand Staircase, stand on sloping decks, touch an iceberg, explore the state rooms, and get to know more about the passengers and crew members on the fateful journey of the RMS Titanic. This one-stop shop for fun features celebrity-owned restaurants, a ropes course, unique shops, candy stores, The Escape Game, Ole Smoky Moonshine, a show fountain, and more! "Cabin was nice decorated very cute! Close to town and shopping. Parking was tight but overall a great cabin!!"